All three films from director Peter Jackson's blockbuster prequel to 'The Lord of the Rings' trilogy. 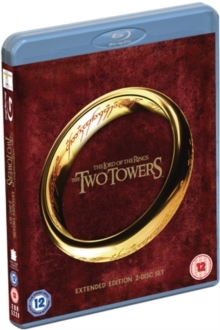 Set in Middle-Earth 60 years before events in 'The Lord of the Rings', 'The Hobbit: An Unexpected Journey' (2012) follows the adventures of Hobbit Bilbo Baggins (Martin Freeman), who, at the instigation of the wizard Gandalf (Ian McKellen), suddenly finds himself co-opted into joining a company of 13 Dwarves led by Thorin Oakenshield (Richard Armitage) to help reclaim the Dwarves' lost kingdom of the Lonely Mountain from the clutches of a dragon. After setting out on their quest from the safety of Bag End, the band of travellers soon find themselves pitted against a range of strange and fearsome opponents, in addition to a small, slimy creature known simply as Gollum (Andy Serkis). In 'The Hobbit: The Desolation of Smaug' (2013), while Gandalf heads south on his own, Bilbo, Thorin and the Dwarves enter the treacherous Mirkwood Forest on their way to the mountain. 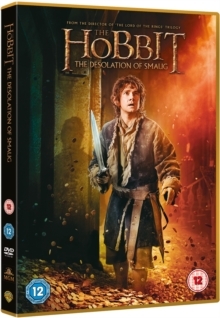 When they reach Lake-town Bilbo has to perform the role he was assigned at the start of the quest - to find a secret door that will lead him to the lair of Smaug the dragon (voice of Benedict Cumberbatch). 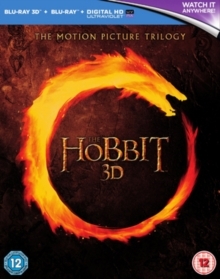 In the final instalment, 'The Hobbit: The Battle of the Five Armies' (2014), Bilbo, Thorin and the other Dwarves have unintentionally released Smaug from the Lonely Mountain and endangered the residents of Lake-town. 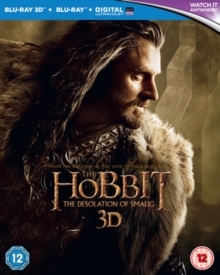 Bilbo has to make a difficult decision when Thorin puts his desire to find the royal jewel Arkenstone before his loyalty to his friends. Meanwhile, Gandalf discovers that the evil Sauron has returned, commanding a horde of Orcs to attack the Lonely Mountain. 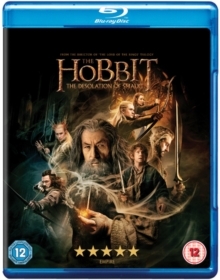 Bilbo and his friends must fight for their survival as five armies meet in battle. The rest of the cast includes Luke Evans, Cate Blanchett, Orlando Bloom, Evangeline Lilly and Christopher Lee. Studio: Warner Bros. Home Ent.